A few months ago I won a competition in which I won a Asus EEE P121 Slate and I’ve been using it a lot more that I thought I would have. I recently moved house and its become the best gadget for on the road and within the house. I thought I would share what we (my wife and I) have been using it for and how useful a Windows Slate really is in a home. My main machine that I work from is a Dell Precision M6400 which is a big, heavy laptop which is great for virtualisation but other than that its hard to move around without straining some muscles! The Slate came with a Bluetooth keyboard and I was recently doing a lot of coach traveling in around Canada and have the Slate with me. I could set the Slate upright on the table in front of me and use the keyboard on my lap allowing me to relax better on the seat, I was constraint by having a normal laptop on me and the height of the screen. The battery would last about 4 – 5 hours which covers most journeys. The built in webcam is very good – while away I used it a lot with Skype catching up with friends back at home and the built is mic didn’t pick up much background within the room. Since getting back I’ve also brought a Bluetooth mouse as I find sitting on the train, typing away and then using your finger or pen to click can become a bit frustrating but having a mouse solves this problem. Even though I’ve had this mouse I still find myself using the keyboard and using the touch screen features rather than a mouse – I guess it just depends on the situation. 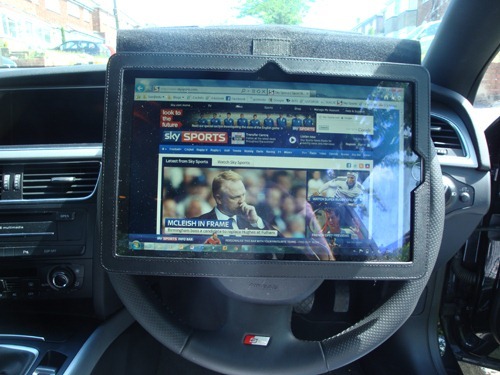 One thing I have found with the case is that it fits very nicely over my car steering wheel allowing me see the screen at a good height while relaxing back in the chair…and no I don’t do this while driving . This is one of the times I really enjoy having a touch device. I can use the keyboard on my lap and easily reach the screen to click. This is a great device for home – if you are thinking you whether to get one or now – trust me it’s worth it for home! When we moved into the house we didn’t have the right cable to link the TV up to the aerial and we still don’t. 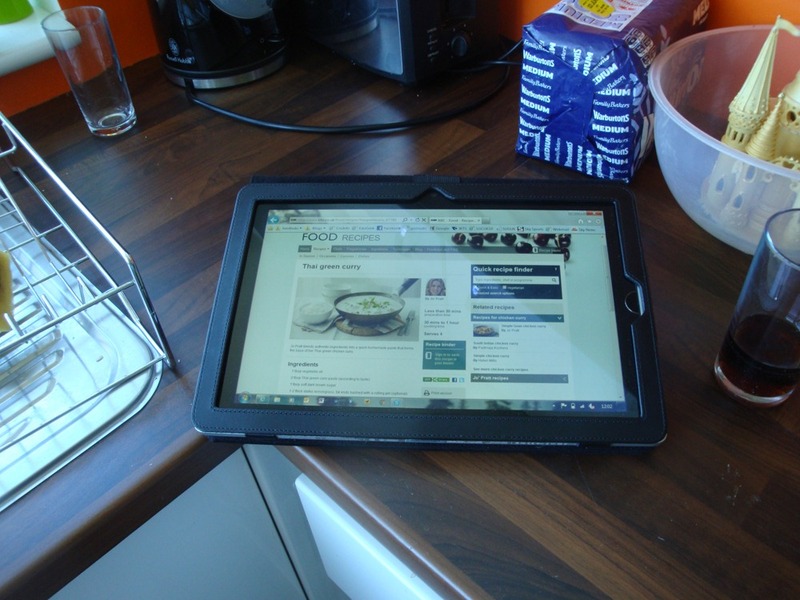 Sometimes I find the Slate in the kitchen being used to read the Food Recipes off the BBC Food site. If the cooking continues to be this good – I’m happy to find the Slate there . 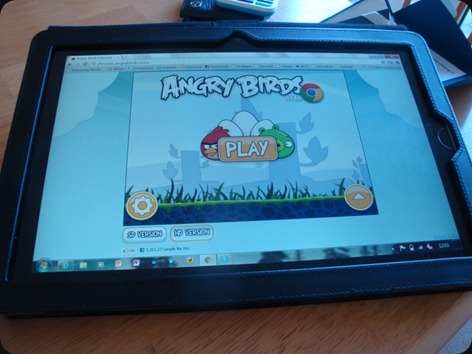 I’m a big IE9 fan now its been released but I still have Google Chrome on my Slate and Laptop and yesterday was the day I found Angry Birds for Google Chrome. It works great with the Slate. Improvements!?!! Yes there are some improvements I would like to see within the OS more than anything else. These are around the touch keyboard is anything – I would like to set the keyboard to allows loads in the same position with the same size keys every time. I would help to learn key placements. I would also like to have a 3G Sim Card built into the device so i can easily access the internet from anywhere. 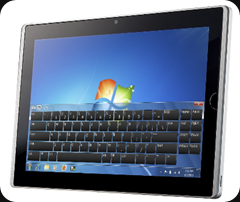 This week Microsoft showed off Windows 8 for the first time and used a Slate to do that with. Can I please have Windows 8, NOW! I can’t wait for the betas to come out. I’ll be installing it straight away but can I also make a request. I love the interface and would like some key apps on release. This is similar to the email client you get on your Windows Phone. Something to quickly view your emails. I can then jump into the full Outlook to do other complicated email stuff. 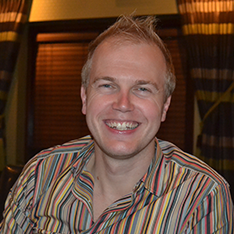 If you haven’t seen Windows 8 yet – take a look at the video below. 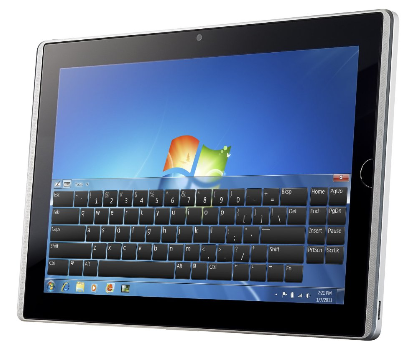 Oh – and go buy a Windows Slate – the best gadget I ever had! Thanks for your time and happy slating!